The Graham Fitkin-Tim Garland Nonet. Photographs: Eric Richmond. www.ericrichmond.net Please credit. Stuart proposed, produced and co-ordinated this project in Spring 2007. Click here for copies of excellent reviews in The Financial Times, Daily Telegraph & Guardian. Thursday, March 15th, 2007. DURHAM: Gala Theatre, for Durham University Musicon Series 2006-7. Friday, March 16th, 2007: AMBLESIDE: Zeffirelli's. Sunday, March 18th, 2007. EXETER: Phoenix Arts Centre for Vibraphonic Festival 2007. Monday, March 19th, 2007. MANCHESTER: Haden Freeman Hall, Royal Northern College of Music. .
Tuesday, March 20th, 2007. LONDON: Purcell Room, South Bank Centre. Wednesday, March 21st, 2007. BASINGSTOKE: The Anvil. Momentum: The Graham Fitkin-Tim Garland Nonet. Graham Fitkin: Piano, Fender Rhodes, Composer, Conductor. Tim Garland: Tenor & Soprano Saxophones, Bass Clarinet, Flute, Composer, Conductor. Geoffrey Keezer: Piano, Fender Rhodes. John Patitucci: Double Bass, Six-String Bass Guitar. Phil Todd: Soprano, Alto, Tenor, Baritone & Contrabass Saxophones, Concert, Alto & Bass Flutes, Piccolo. Noel Langley: Trumpet, Flugelhorn, Piccolo Trumpet. 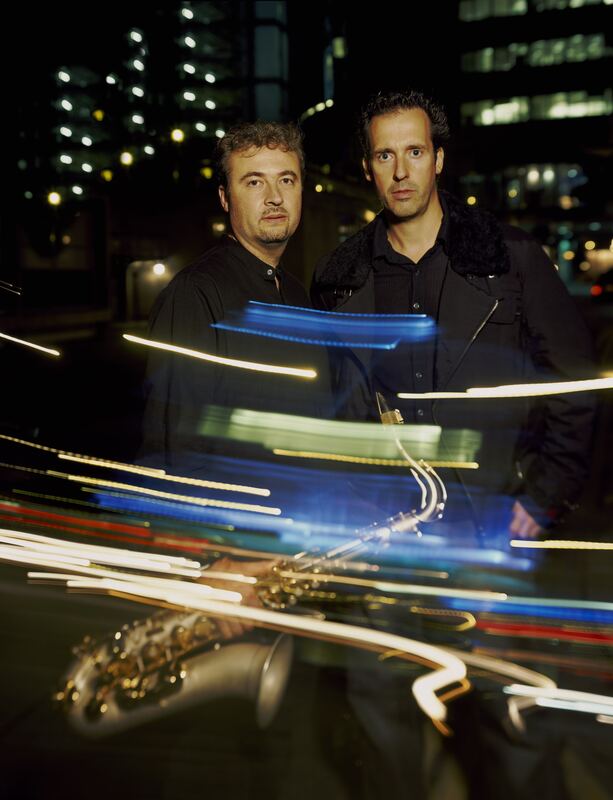 Established leaders in their respective fields, Tim Garland and Graham Fitkin pit the harnessed energy and precision of classical music against the free adrenaline-rush of jazz in two major new works. Presented as a contemporary concerto grosso, both composers will perform alongside a hand-picked band including the unparalleled talents of John Patitucci, the most in-demand bassist on the planet, plus top US jazz musicians Geoffrey Keezer and Joe Locke, alongside current members of the London Philharmonic and London Symphony Orchestras. This exclusive Contemporary Music Network tour brings together some of the world�s finest contemporary artists to present new music at its best. Momentum fuses the complexity of two composers� music into a coherent whole within a live context. Two ensembles will reflect and respond to one another through composed and improvised music, pivoting around the double bass. An improvising trio of Tim Garland (saxophones), Geoff Keezer (keyboards) and Jo Locke (vibes) will be at the heart of, but distinct from, the larger ensemble lead by Graham Fitkin. A former student of Louis Andriessen, Graham Fitkin�s highly energetic compositional style has attracted commissions and performances from some of the world�s leading ensembles and soloists including the RLPO, BBC Phil, Tokyo Symphony, RSNO, The Duke Quartet, Peter Donohoe, Noriko Ogawa and Kathryn Stott. Graham frequently works with choreographers across the world including Random Dance and New York City Ballet. As a pianist, Graham has recorded much of his own extensive repertoire to critical acclaim. Recently, he has increasingly been using computer and sampling technology and his new album for harps and electronica, Still Warm (out in June 07), features Ruth Wall performing on three different harps - the Scottish lever harp, the buzzing bray harp and the wire strung harp � to combine ancient sounds and new technology. Tim Garland is one of a highly select group of British jazz musicians to have established a serious presence in the United States, chiefly as a result of the years he spent in Chick Corea�s band, an association which he still maintains. Regarded by many as one of the greatest British improvising musicians, recent commissions from the LSO and Northern Sinfonia are testament to his growing reputation as a composer. Tim�s orchestral album, The Mystery featuring Chick Corea, will be out in March to coincide with the tour and presents another fine example of his ability to combine modern orchestral language and improvised jazz. Based in New York, John Patitucci has an enviable reputation as one of the finest bass players in the world and performs the pivotal role in this project. John has worked with an awesome array of artists from BB King to Bon Jovi, Ry Cooder to Henry Mancini, Sting to Carole King. Like Tim Garland, his association with Chick Corea for over 20 years has brought him worldwide acclaim. Winner of countless magazine polls and also a number of Grammy awards, John is also a leading composer for many mediums and has toured the globe with his group the John Patitucci Quartet. John is currently a member of the Wayne Shorter Quartet. Geoffrey Keezer started his career as leading jazz pianist at the age of 18 with two job offers, one from Miles Davis, the other from Art Blakey. He chose the latter and has since worked with almost all the living legends of jazz and world class musicians from all genres including Diana Krall and Barbara Hendricks. Regarded by many to be the most gifted vibraphonist of his generation, Joe Locke has worked with an impressively diverse range of artists including Dizzy Gillespie (before he was even out of high school), Rod Stewart, the Beastie Boys, Dianne Reeves and more. Arts Council England's Contemporary Music Network has been at the forefront of the new music touring scene for nearly 35 years. Throughout this time it has presented a dazzling array of world-class artists to audiences across the country. Each season�s programme covers an impressive spectrum of the most important developments in contemporary music genres, including contemporary classical, jazz, improvised and world music, electro-acoustic and electronic innovations, music theatre ventures and collaborations with other media. Many of the tours have included international artists who would not have performed beyond London without CMN�s support. A true musician with the ability to sustain interest through the most complex of rhythmic developments. CD Review. Granite is a tour-de-force. The Independent on his piano concerto. This may turn out to be one of the most important pieces of the age. The Independent on Agnostic, his clarinet concerto. It hardly gets better than this.. Mojo CD of the month for the Storms/Nocturnes trio with Keezer and Locke. Not only a commanding saxophonist, but a brilliantly inventive writer. The Independent. Barnstorrming solos, exemplary ensemble work, utterly distinctive. The Times. Garlands sheer virtuosity is breathtaking. The Guardian.